Having wedding musicians or professional singers at your wedding ceremony will immediately elevate the mood and sense of occasion. Some wedding singers sing during the ceremony itself, some musicians play the processional song, some just at the reception and others do a combination.The wedding singer may also act as Master of Ceremonies, directing the guests through the day’s events. Music is the language of the soul and has the power to transform mood and feeling, to create synergy, atmosphere and bring people together. 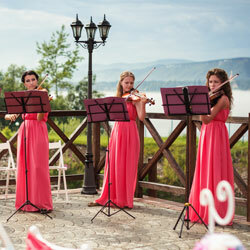 Acoustic or live music can define your wedding day. Acoustic musicians are highly talented as there is no backing sound for them to hide behind! If one of you has another country or culture’s heritage, this can be incorporated subtly through music in an amazing way to include and amaze guests instead of distancing them. Musicians can play before the procession, during the exchange of rings, for the hymns or ceremony songs and the recessional walk. They can also help provide music for the first song, father-daughter dance and mother-son dance. Having a distinct musical motif to complement your overall wedding theme accentuates the dominant idea in your own wedding love story ensuring the feelings, memories and truths of the day are shared with the people you care most about. Professional musicians have their own flair and style and can artistically interpret any theme given to them.